Google Maps is a desktop and mobile web mapping service application and technology provided by Google, offering satellite imagery, street maps, and Street View perspectives, as well as functions such as a route planner for traveling by foot, car or with public transportation. Also supported are maps embedded on third-party websites via the Google Maps API and a locator for urban businesses and other organizations in numerous countries around the world. 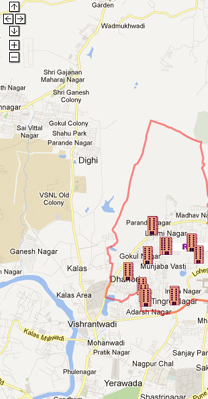 We at ULTIMATE ITPL using the google map services for generating live election ward boundary maps. Plotting of required boundary for particular area of Municipal Corporation for its wards, pointing of Polling Stations for the elections, pointing of RO offices, police stations etc.